As freelance writers, we spend a great deal of time quickly researching topics we’re unfamiliar with and then producing articulate web content that makes it sound like you know what you’re talking about. A brief scan of several other informative websites often gives you background information and inspiration to write what your clients have asked for. You wind up putting together and submitting an article to your client and begin the process over again with a new topic and don’t think about it again. The trouble begins when a few weeks later, your client contacts you and states that they received notice that the content was plagiarized, and you’re left with an angry client and a mess to deal with. 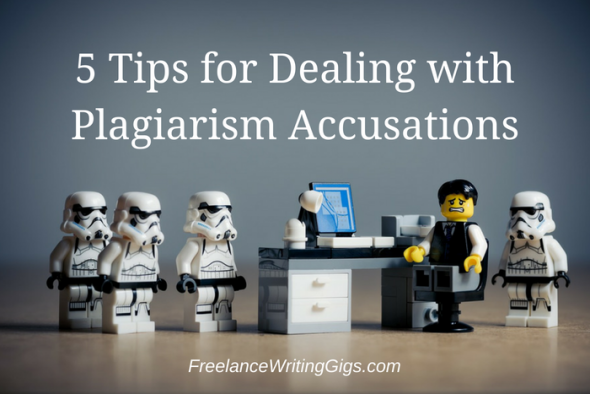 Here are some tips for dealing with a plagiarism accusation. If you hope to keep your reputation in good standing, you need to respond to your client about the accusation immediately. Do not ignore it or downplay it. Explain that you understand why they are upset but do not admit any fault or wrongdoing. Unless of course, you did intentionally plagiarize. That’s a whole other ballgame. Ask to see the evidence of plagiarism so that you can try to understand how someone, or in more cases these days, software, came to that conclusion. Sometimes, in our rush to meet deadlines, we do make mistakes and unintentionally plagiarize. This can happen when we quote an article that was itself based on a third party’s work. It can happen when you quote the website where you found information, rather than the original author, like when an organization puts the key points of a peer-reviewed paper on the web-page, but the paper itself is cited in fine print at the bottom. In these cases, a simple apology for your oversight and a revised citation may be all that is needed, along with an explanation of how you intend to avoid similar problems in the future. If it wasn’t just a matter of a simple oversight, you should examine both pieces and determine why someone might think it was plagiarized. Did both pieces use similar sub-headings? Similar themes and ideas? 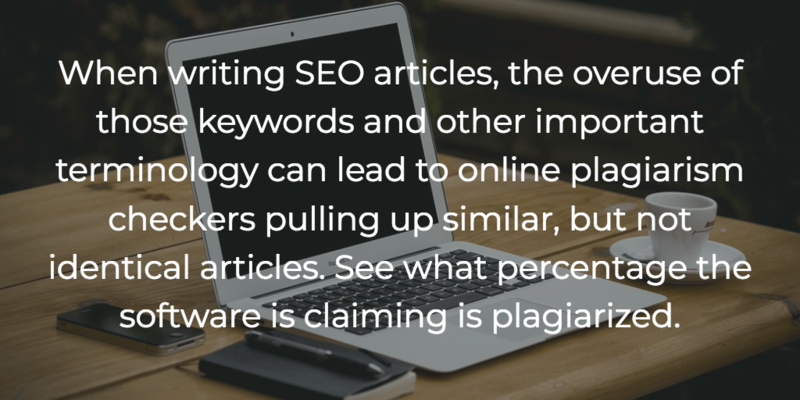 When writing SEO articles, the overuse of those keywords and other important terminology can lead to online plagiarism checkers pulling up similar, but not identical articles. See what percentage the software is claiming is plagiarized. It may only be 27%, which is not an indication of actual plagiarism. You may be able to simply point out that the pieces are different enough that the software may have made a mistake. Sometimes, websites have been known to flag your own content as plagiarized after it’s been shared by others. If your content is being shared on social media, it may simply be that it’s shown up on several new websites. Another possibility is that someone removed the credit from your work by quoting the work on their own page after reading your article. Usually, this will occur along with a link to your article, which should clear your name. If there is another article out there that is disturbingly similar to yours, but you know your content was original, it may be time for some detective work. Sometimes plagiarism checkers send out automated responses to both parties when two identical articles show up. If someone copied the work that you submitted after it was published, your client may have gotten a notification anyway. Check the dates of publication. If you worked on the piece in Word, provide the document to the client so that they can check the properties page, which will outline the date and time the piece was started, as well as how long you spent editing the work, which can be helpful in vindicating you. As long as you’re creating original content when writing and properly cite your sources, you should be able to easily defend yourself against plagiarism accusations. If not, you should consult with a lawyer to help determine your options. This post was written by Lucy Taylor. She is an avid blogger who enjoys sharing her tips and suggestions with her online readers. Working as a legal expert at LY Lawyers, Lucy often helps people dealing with legal problems, addictions and crime. Wow. These are very helpful tips. Thanks a lot!